Fallout 4: Far Harbor briefly tells the story of the old Longfellow, who has lived earlier in one of the numerous vaults and has currently established as a fisherman on the island. Fortunately, you meet the new companion early in the game. We show you below what Longfellow likes and dislikes, so you can increase your relationship level with the new recruited companion. 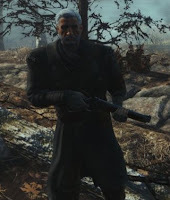 Fallout 4: Far Harbor - Where do you find Longfellow? - Go into the bar last plank where the new companion in Fallout 4: Far Harbor sits at a table. - Speak to Longfellow and entertain him until he has nothing more to say. The new companion Longfellow is a fisherman in hunter jacket. In combat, he supports you with a lower lever rifle, which uses two different types of ammunition 45 - 70 caliber. Hunter knowledge: Reduce damage and power resistance in animals and sea creatures.